The history of Kosovo can begin narrated with the first inhabitants of the Balkan Peninsula that was the ancient civilization known as the Illyrians.Then in Kosovo’s history we find that the Slavs lived in Kosovo later in the sixth and seventh centuries. Also do not forget the history of Kosovo to the Albanian language speaking began moving into Kosovo from the Adriatic in the eighth century. Kosovo was ruled by Bulgaria in the ninth century until the Serbs took control of Kosovo in the twelfth century. Kosovo was also the site where the Serbs were defeated by the Ottoman Turks in 1389. Kosovo was then absorbed by the Ottoman Empire. The battlefields of Kosovo are often represented in the Serbian poetry and has great national importance as the cradle of Serbian civilization. The Ottoman Empire ruled Kosovo for centuries in the history of Kosovo, until 1913, when Serbia retook control of the region. Under Ottoman rule, the region became increasingly populated by people who spoke Albanian as well as a large number of Christian Serbs who emigrated. (The Albanians are mostly Muslims.) 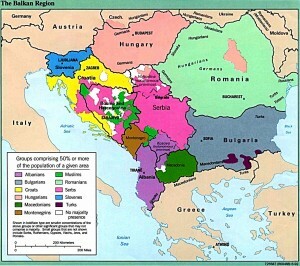 Some of the most recent history of Kosovo we can mention that in 1918, Kosovo became part of the Yugoslav Federation. Other anecdotal evidence of the history of Kosovo is that the Kosovo Albanians opposed to attempts by Serbia to transfer to Kosovo Serbs in the 1920’s and 30’s. During the Second World War, the Kosovo Albanians tried to unite with Albania, but the Yugoslav government thwarted the rebellion. After the war, Kosovo became an autonomous region within Serbia under the command of Josip Broz Tito. In the postwar years, we find in the history of Kosovo Albanians who cultivated their national identity and assumed a more active role in government, with the tacit approval of the capital, Belgrade. It is notable in the history of Kosovo as the province Albanianisation coincided with the migration of Serbs. The 1974 Yugoslav constitution granted Kosovo the status almost equivalent to that of a republic. By 1981, the Albanians had 75% of the population of Kosovo, and 90% by 1991. Finally we can say about the history of Kosovo that the Serbian constitution of 1989 greatly limited the autonomy of Kosovo. But another significant event in the history of Kosovo was in 1991, Kosovo Albanian leaders attempted to break free from Serbia who used nonviolent resistance. The government of Serbian President Slobodan Milosevic punished the efforts of the Albanians to gain independence. In 1995, Kosovo’s ethnic Albanians, frustrated by the lack of progress towards independence under Ibrahim Rugova, formed the separatist Liberation Army of Kosovo and began an armed insurrection. Negotiations between the European Union, Russia and the United States on the future of Kosovo ended in an end in November 2007.On February 17, 2008, Kosovo Prime Minister Hashim Thaci declared independence from Serbia, which, as expected, also denounced the move. Serbian Prime Minister Vojislav Kostunica said he would never recognize the “false state. “International reaction was mixed, with the United States, France, Germany and Britain indicated they planned to recognize Kosovo as the country number 195 of the world. Serbia and Russia, however, called the move a violation of international law. The court decree in July 2010 that Kosovo’s declaration of independence did not violate international law. However, the court did not say anything about Kosovo’s legal status. The decision was considered a compromise on both sides. The rule does not bind, is instead an advisory decision. Sixty-nine countries, including the U.S., have recognized Kosovo as independent. Indeed very recent and very important in the history of Kosovo. Keywords: History of Kosovo. Serbian Kosovo wars. Independence of Kosovo. Historic events in Kosovo. Civilization Kosovo. Human rights in Kosovo. UN in Kosovo. The war in the Balkan countries.News Kosovo.